Every avid hunter would agree that a good hunting vest is a vital gear in hunting because of a number of very important tasks it performs. And today there are many of these vests available out there, making it very confusing to find the right ones to purchase, especially one that would be up to the task and at the same time not get in the way during hunting. A good example of one such outstanding vest is the GameHide Upland Vest. In this review we shall introduce to you some of the most useful features of this vest that makes it highly demanded. In addition to that, we shall also devote some time into looking at the pros and cons that come with this vest as well as a sample of some of the most commonly asked questions regarding this bestselling hunting vest. The main goal of this review is to help you decide whether this vest is worth purchasing or not. 1.7.1 Q. Who are the manufacturers of this hunting vest? 1.7.2 Q. Does the GameHide Upland Vest come backed by a warranty? 1.7.3 Q. Do the pockets of the vest have shell loops inside them? 1.7.4 Q. Is this vest available in multiple colors? 1.7.5 Q. How much abuse can this vest withstand? 1.7.6 Q. Is the game bag of this vest located on the front or the back? 1.7.7 Q. Does this vest’s rear game bag come zippered? 1.7.8 Q. Are the game bags of this vest blood-proof? 1.7.9 Q. Is the Gamehide Upland Vest’s back totally blaze orange? 1.7.10 Q. Do the shoulder patches of this vest protect the user from recoils? The outfit comes with a high quality, heavy duty material which does an amazing job holding out against bad weather and the strongest or toughest brush. As if this isn’t enough, the vest is sewn using reinforced stitching that gives the vest the ability to last for years no matter how much abuse or pressure you or nature puts upon it during your hunt. Indeed, this product beats the majority of its competition when it comes to the issue of durability! One of the most notable features of the GameHide Upland Vest is its two blood-proof game bags – one located at the vest’s front and the other at its back. The primary functions of these bags are to carry your kills while at the same time preventing the blood of the animals from staining your clothes. And there’s more! The rear game bag is colored blaze orange – a color that plays a very instrumental role in providing the hunter with additional safety since it is bright enough to prevent you from being accidentally shot by your fellow hunter. One of the most common problems experienced by many hunters who use firearms is the problem of recoils from their weapons. However, thanks to the quilted shoulder patches that this hunting vest comes equipped with, your shoulders are no longer going to suffer from the harmful effects of recoil produced by your firearms simply because these shoulder patches will soften the impact of recoils during shooting. In addition to the back and front game bags mentioned above, this vest comes with a number of spacious pockets, including the oversized dump pockets designed to safely and conveniently store some of your hunting gears. In addition to the massive storage space the vest’s pockets provide, they are also designed to offer you quick and easy access to the items stored in them. The vest is both solidly crafted and durable. It comes with a lot of spacious storage pockets. It is fitted with quilted shoulders that save your shoulders from the recoil of firearms. It has 2 blood-proof game bags. It comes with a blaze orange colored back for additional safety. The price is reasonable and fair. The manufacturers support it with a 1 year warranty. The vest would definitely have been better had it come in smaller sizes since a number of customers complain of the vest being slightly big for them. 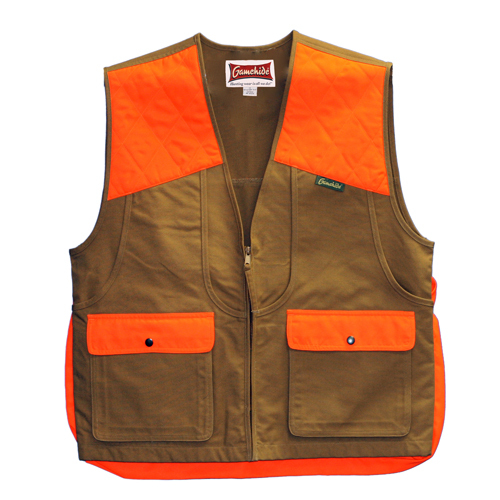 Although the vest’s back is blaze orange and provides safety by being visible to other hunters, it would have been more visible and safer if the entire back was orange. The pockets don’t have shell loops in their interior. A. The vest is manufactured by Gamehide, which is an American company famed for manufacturing some of the highest quality hunting garments in the industry. Q. Does the GameHide Upland Vest come backed by a warranty? A. Yes, it does. When you purchase this vest from an authorized Gamehide distributor, the product comes with a 1-year warranty. Q. Do the pockets of the vest have shell loops inside them? Q. Is this vest available in multiple colors? Q. How much abuse can this vest withstand? A. A lot! Thanks to the reinforced stitching of the vest, it can survive years of being severely abused. Q. Is the game bag of this vest located on the front or the back? A. It comes with two game bags located on its back and front. Q. Does this vest’s rear game bag come zippered? A. Yes, it is zippered. Q. Are the game bags of this vest blood-proof? Q. Is the Gamehide Upland Vest’s back totally blaze orange? A. No, it isn’t. The back of the vest is made up of 2 colors, namely brown and blaze orange. However, the latter color occupies the majority of the surface of the back. Q. Do the shoulder patches of this vest protect the user from recoils? A. Thanks to the quilted shoulder patches that this hunting vest comes with, it is capable of reducing the recoil produced by your firearms upon pulling the trigger. As you have seen from the GameHide Upland Vest review above, this vest stands out from many others in its class due to its very useful features such as its remarkable durability, front and back-loading blood resistance game bag, plenty of storage space, and the fact that it is quilted at both shoulders to save you from firearm recoil. And what’s more, the manufacturers of the vest support it with a 1-year warranty. Having gone through the review above, we hope that by now you have at your disposal all the relevant information you need regarding this hunting vest in order to make a well-informed decision whether to slip into this outstanding vest during your next hunting trip or not.